Every sea angler must have had the experience of planning a fishing trip and then finding that conditions were unfishable at the chosen time and place. A couple of weeks back (late October - early November) I had decided on an early morning bassing session along the Purbeck coast. Even before I left the house I could see that the writing was on the wall in indelible ink. The trees in my garden were being lashed by a gale from the south west - my heart sank. Sure enough, when I got to the coast the sea was rough and filthy. One look over the cliff told me that not only would it be unfishable but it was also downright dangerous. It was even rougher than when I caught the big fat mullet mentioned in my last report. I climbed back in the car and had a think about the options. I could give it best and go home or I could try to find a spot which was sheltered from the south west wind. 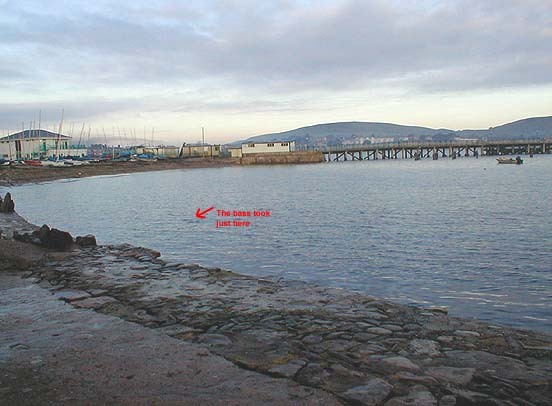 One place that sprang to mind was Swanage - only a twenty minute drive and facing exactly the opposite direction. To cut a long story short I arrived to find the sea flat as a pancake and gin clear. Just two minutes walk from my parked car I was able to cast onto the almost glassy calm water from the shore just behind the old pier. Second cast, much to my amazement, as always seems to be the case with these lures, the popping plug was grabbed by a small bass. I landed the fish and after taking a couple of pictures, returned it to the sea. A couple of days later the wind had eased a lot but I decided to have another go from the same spot. This time the popper produced nothing but a switch to a floating/diving Rapala J11 was rewarded by a small wrasse and then, after switching to a bigger J13 a bass. Fish which I would not have caught unless the wind had 'blown me off the beach' on the previous trip. Every cloud has a silver lining. Even in a stiff SW wind Swanage bay, facing east, is very sheltered. A nice little bass which took a Rapala Skitterpop lure twitched along the surface. 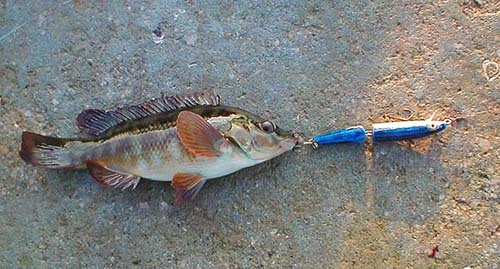 Wrasse of all sizes are common catches on buoyant plug baits. 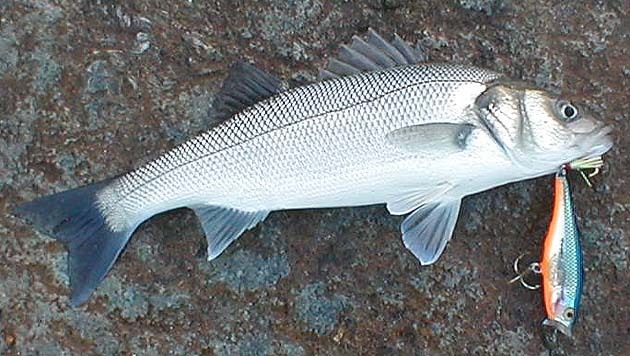 Having changed to a bigger plug I caught (and returned) a bass just beside my parked car on the seafront.